For the first time in 50 years, Ellison’s second novel returns to print in a substantially revised and expanded form. Also included are three of Ellison’s best long-form stories. 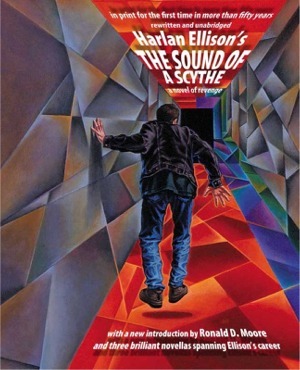 This 336-page paperback features:The Sound of a Scythe, Harlan Ellison’s never-before-republished second novel—appearing for the first time under the author’s preferred title (the original publisher renamed it The Man With Nine Lives without Ellison’s consent)—expanded by 25% from its 1960 publication and extensively rewritten by Ellison for this appearance. Virtually every page has been finessed by the author.”Mefisto in Onyx”—The Bram Stoker Award-winning novel of a telepath who’s asked by his best friend to journey into the mind of a serial killer on death row.”All the Lies That Are My Life”—Ellison’s novella about a world-famous writer who overshadows his best friend from beyond the grave.”The Resurgence of Miss Ankle-Strap Wedgie”—A Veronica Lake-inspired tale of a rediscovered silver-screen star’s brutal return to Hollywood. A new introduction by Emmy-nominated tv writer Ronald D. Moore, creator of the reimaginedBattlestar Galactica and writer/producer of Star Trek: The Next Generation, Roswell, and HBO’s critically acclaimed Carnivale.